United States, Airmail, 1926-27, Map & Planes Complete, Sheets of 50, #C7-C9, n.h., C7 portion of corner selvage trimmed, C8 one copy slightly dist. gum, C9 bottom row light gum streak, fresh, Fine to Very Fine. 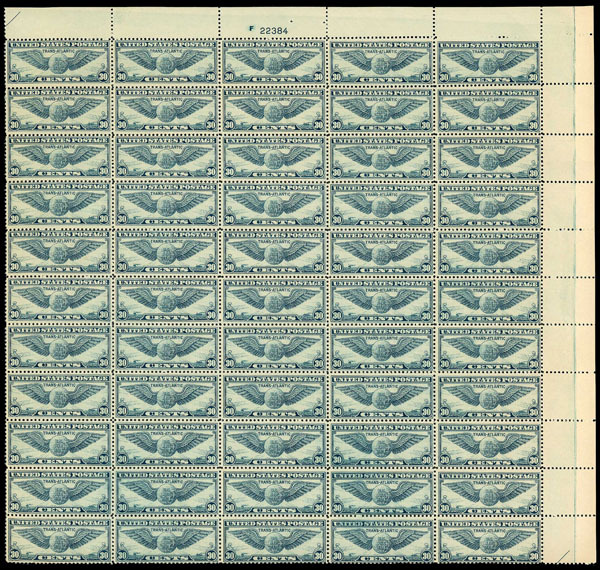 United States, Airmail, 1927, 10¢ Lindbergh, Complete Sheet of 50, #C10, n.h., nicely centered, overall Very Fine. United States, Airmail, 1930, Set Complete, #C13-C15, n.h., Fine to Very Fine. 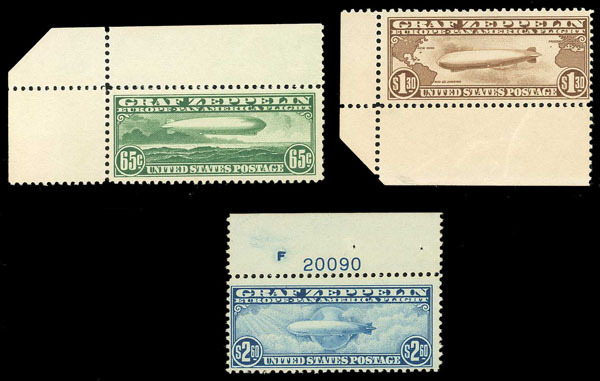 United States, Airmail, 1930, Graf Zeppelin Complete, #C13-C15, marginal copies, tiny gum skips, C13 l.h., C14 n.h., gum crease, C15 n.h., pl. #20090, Fine to Very Fine. United States, Airmail, 1930, Graf Zeppelin Complete, #C13-C15, l.h., C14 light gum crease, C15 light gum crease and two corner creases, Fine. United States, Airmail, 1930, Graf Zeppelin Complete, #C13-C15, C13 n.h. with pl. #20079, C14-15 o.g., C15 faint toning, Fine to Very Fine set. United States, Airmail, 1930, $1.30 Graf Zeppelin, #C14, n.h., light horizontal wrinkles, Fine to Very Fine centering. United States, Airmail, 1930, $2.60 Graf Zeppelin, #C15, n.h., graded 98 Superb, 2013 P.S.A.G. certificate. United States, Airmail, 1930, $2.60 Graf Zeppelin, #C15, unused, Fine to Very Fine centering. United States, Airmail, 1930, $2.60 Graf Zeppelin, #C15, used, large copy, Fine to Very Fine. United States, Airmail, 1933, 50¢ "Chicago" Zeppelin, Plate Block of 6, #C18, n.h., top #21172, usual gum bends, nicely centered, Very Fine. United States, Airmail, 1933, 50¢ "Chicago" Zeppelin, 12 Examples, #C18, o.g. (2), n.h. (10), 2 blocks and 4 singles, Fine to Very Fine. United States, Airmail, 1932, 8¢ Winged Globe, 1934, 6¢ Winged Globe, Complete Sheets of 50, #C17, C19, n.h., C19 one row with perf seps., well centered, overall Very Fine. 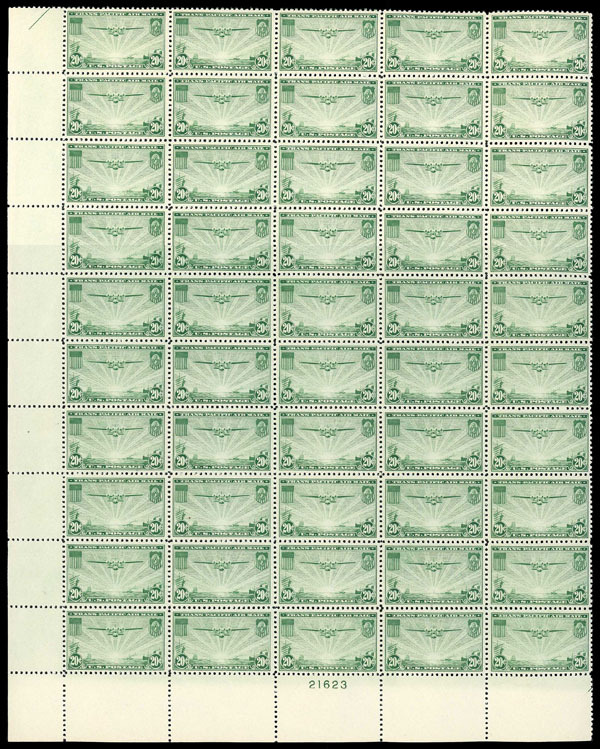 United States, Airmail, 1935-37, China Clipper Complete, Sheets of 50, #C20-C22, n.h., well centered, overall Very Fine. 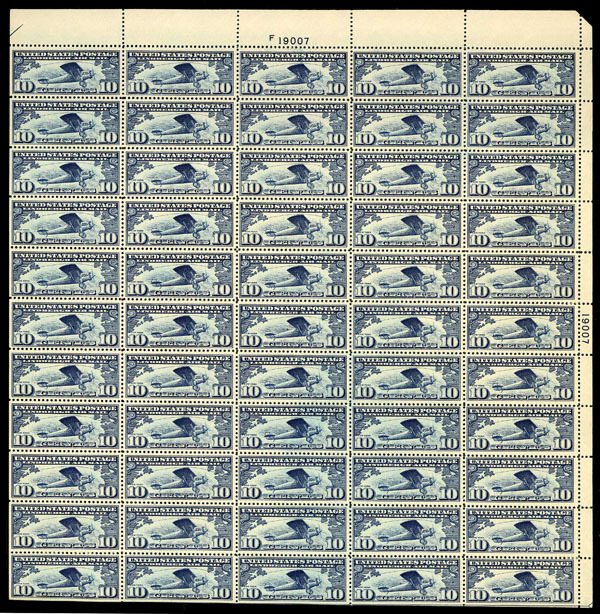 United States, Airmail, 1939, 30¢ Transatlantic, Complete Sheet of 50, #C24, n.h., gum streak and missed gum spots at top affecting pl. blocks, Fine to Very Fine. 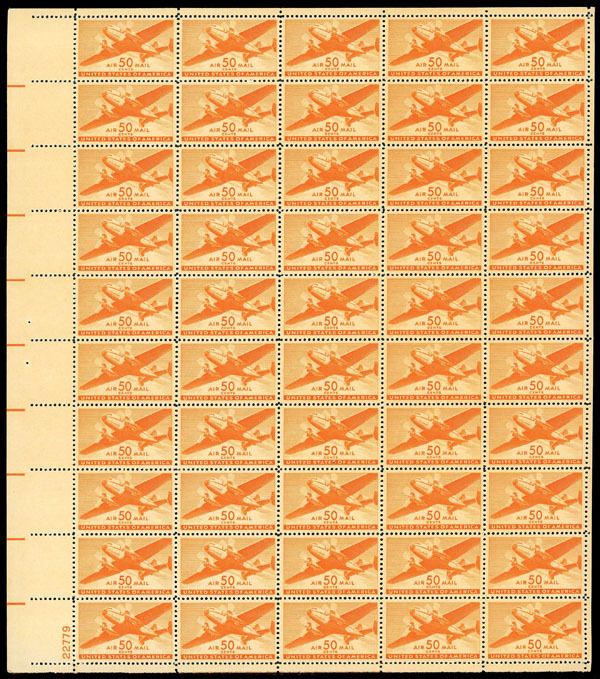 United States, Airmail, 1941-44, Transport Complete, Sheets of 50, #C25-C31, n.h., overall Very Fine. 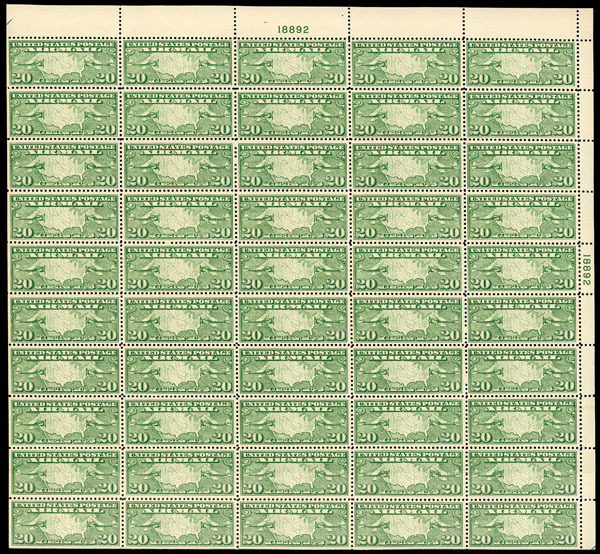 United States, Airmail, 1952, 80¢ Hawaii, Complete Sheet of 50, #C46, n.h., Very Fine.